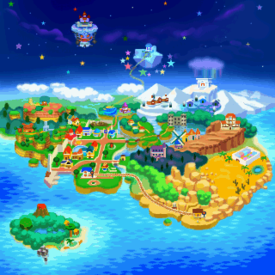 Goomba Village is a small village in the northwest of the Mushroom Kingdom in Paper Mario. It is populated by a single family of Goombas and a Toad who runs the Toad House. Goomba Village is the first town and location Mario visits after being beaten by Bowser, and with only two houses and seven inhabitants, it is also the smallest. In the prologue, Mario learns basic skills in this village before he sets off for Toad Town. He also gets his first badge and partner here. Goomba Village is the only place in the game where Mario can find Goomnuts. Goomba Village is surrounded by woods. The area to the back of the village is occupied by Jr. Troopa, who is beaten by Mario here for the first time. Here is where Mario gets the Hammer in order to set off from the village in the prologue. Later in the game, Mario needs to go back to the village in order to deliver letters with Parakarry or do Koopa Koot's favors, though this is optional. This area links to Toad Town via the Goomba Road. It can also be accessed from a warp pipe in the Toad Town Tunnels. The in-game map description reads, "Beaten by Bowser, Mario fell into the forest near here. Goombario's family lives here, and there's a Toad House, too." Goombaria discovers Mario in the clearing. There is a clearing to the southwest of Goomba Village. In the prologue of Paper Mario, Mario is beaten by Bowser, who has the Star Rod which can grant any wishes, and falls from Peach's Castle in the sky to this opening near Goomba Village where he lies unconsciously. Concerned about the stolen Star Rod, the seven Star Spirits appear here and transfer all their power to Mario. After that, Goombaria comes here, spots Mario, and asks her family for help. The Goomba family eventually put him in the Toad House where he recovers. Mario can later come back here and get a Star Piece under a panel at the center of the clearing. Kammy Koopa creating a Yellow Block to block Mario's way to the east Toad Town. In the northern side of Goomba Village are a Toad House, the Goomba House (as called by Chuck Quizmo) and a Goomnut tree. There is a gate in the northwest that leads to the back area and a gate in the east to Toad Town via the Goomba Road. There is also a save block and a pipe to, and can be unlocked from, the Toad Town Tunnels. Initially Mario is recovering in the Toad House and receives a vision from Eldstar via his dream. He then wakes up and is greeted by the Toad House manager, who suggests that he pay a visit to the Goombas. Out in the village, Goompa is fixing the balcony behind the Goomba House, and Goompapa is fixing the gate in the east, and, upon knowing that Mario needs to go east, suggests that he wait for a while. The gate to the area back of the village is not available at this point. After Mario visits Goompa in the balcony, Goompapa will finish his work. When Mario is about to go, however, Kammy Koopa appears and makes a yellow block that stops Mario from going further. 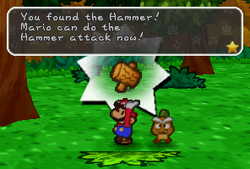 Goompapa then suggests using Goompa's Hammer to destroy the brick. But the second time Mario visits the balcony, it is missing and Mario falls to the area behind Goomba Village. When Mario returns here later from the northwest, equipped with a hammer and with Goompa, Goompa unlocks the door and reunites with the family. Mario receives a Power Jump badge from Goompa, who then suggests that Goombario, the young Goomba boy in the family, travel with Mario. Goombario then joins Mario's party and the two hammer the brick in the east of the village, heading for Shooting Star Summit in Toad Town. The Goomba family lives here, except that Goombario joins Mario's party in the prologue and Goombaria will go with her mother to shop in Toad Town during Chapters 5 – 7. In the Goomba House, Goompa stores the Tape from Koopa Koot whose third favor involves getting this tape back. At the end of the game, Goombario is seen having returned from his adventure with Mario and receiving a letter delivered by Parakarry. The letter turns out an invitation from Princess Peach and the Goomba family heads for Princess Peach's Castle. Mario revealing a Star Piece in the area back to Goomba Village. To the back of the village is a lower area mainly consisting of grasslands. After Mario falls here, Goompa explains to him that he has fallen with the balcony earlier while fixing it and that there is (another) brick they have to finish off to return to the village. The two then go find the hammer that has fallen to the woods to the left. In the middle of this scene is a fence that splits the left and the right areas apart. Goompa and Mario fall to the left of the fence. To the left of this scene is what Jr. Troopa calls his playground. After Mario and Goompa return with the hammer, they can smash the brick in the opening fence and go to the eastern part of the area. The right side has a trampoline in its back. Above it are three coins and a Fire Flower. There is also a Heart Block, a metal block, and various other blocks. Mario can smash the stone block after getting the Super Hammer from Chapter 2 to reveal an invisible block containing a Repel Gel. There is also a Star Piece under an invisible panel on the ground. To the right is a path back to Goomba Village. Finally, in the tree near the fence is a Mushroom. Mario and Goompa find the hammer in what Jr. Troopa calls his playground. To the left of the area back of Goomba Village is a land with many trees, bushes, and brick blocks. This is what Jr. Troopa calls his playground. The first time Mario enters here, Goompa explains to him what a Hammer looks like. Mario can find the Hammer in a bush. Coins are also scattered in the trees and bricks. When they return, however, Jr. Troopa comes, kicks Goompa, and blames the two for entering his playground without permission. He then battles the two. After Mario wins, Jr. Troopa says he will come back. (He will be provoking Mario several times throughout the rest of the game.) This is a tutorial battle that teaches the player about Jump attacks, Hammer attacks, and Star Points. There is a save block at the center of this area. A doll called Dolly can be found in the tree near the entrance. If Mario gets this item (by hammering the tree) when he is with Goompa, Goompa will comment that Goombaria has lost it. The path between the back area and the village center serves as a tutorial on in-field enemies in the prologue. First entering this area, Goompa will warn Mario of the Goombas ahead and tell him about First Strikes. This is a long path, similar to the ones on Goomba Road. Linking Goomba Village and the low area behind it, this path is also crooked and ascending. There is a Goomba walking on the road, a Spiked Goomba hiding behind a mushroom who will jump out upon seeing Mario, and a Paragoomba flying in the sky. To the north is a fork going left with another Goomba, a tree, and a Star Piece. This is the first Star Piece Mario can get on his adventure. Goompa The Goomba grandfather. He fixes the veranda and accompanies Mario in the prologue. He is in the wooden house for the rest of the game. He's my grandpa, Goompa. He knows oodles of stuff. Ever since I was a kid, he's been telling me fantastic stories of his youth. Gooma The Goomba grandmother. She is in the wooden house throughout the game. She's my grandma, Gooma. I hope she lives forever! She's the greatest! When she starts telling old stories, she always says, "When I was young, I was very popular with the boys." Goompapa The Goomba father. He fixes the gate in the prologue and is near there for the rest of the game. He's my dad, Goompapa. He's willing to do anything for us. We can always count on him. He doesn't really look like it, though. But did you see him fixing stuff after that earthquake? That's when I knew he was cool. Goomama The Goomba mother. She is usually in the village's open area, but goes shopping in Toad Town with Goombaria during Chapters 5 – 7. She's my mom, Goomama. She sometimes gets on my nerves when she worries too much about me, but I still love her lots. Don't tell her what I just said! Seriously, Mario! Promise me! Goombaria The young girl in the Goomba family. She is usually in the village's open area, but goes shopping in Toad Town with Goomama during Chapters 5 – 7. She's my sister, Goombaria. She's a spoiled girl, but still, everyone's always nice to her. Why? (Toad) The Toad running the Toad House. He's a regular Toad. He was sent here from Princess Peach's Castle. He's the manager of this Toad House. For enemy formations in Goomba Village, see here. Power Jump In the prologue of Paper Mario, Goompa will give this badge to Mario at Goomba Village. Letter From Goompapa after delivering his letter found in Mt. Rugged. This is the first letter in the long chain. Lucky Day From Goompapa after delivering his letter from Frost T. This is the final reward for delivering the long chain of letters. Star Piece Under a hidden panel in the peaceful clearing to the southwest of Goomba Village. Under a hidden panel near the Stone Block in the area back of Goomba Village. At the end of the fork north of the path to the northwest of Goomba Village. Given by Goombaria after Mario gives her Dolly back. Given by Goompa as a reward for delivering his letter from Dry Dry Desert. Repel Gel In the hidden block of the area back of Goomba Village (see below). Dolly In the tree near the exit of Jr. Troopa's playground. Originally belongs to Goombaria and probably stolen by Jr. Troopa. Tape Given by Goompa while doing Koopa Koot's third favor. Goomnut Produced by the Goomnut tree in the northeast corner of Goomba Village, can be obtained infinitely by leaving the scene and returning. Shooting Star On the veranda of the Goombas' house, can be obtained after visiting the Shooting Star Summit. Mushroom On the tree near the fence in the area back of Goomba Village. Fire Flower High above the trampoline in the area back of Goomba Village. Additional items include Mushrooms which can be dropped by Goomba-based enemies on the northwestern path, and Star Pieces from Chuck Quizmo who has a chance to appear in the village. 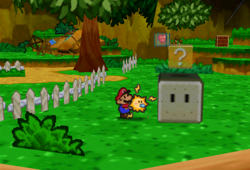 Repel Gel In the area immediately east of Jr. Troopa's playground, Mario will find a gray block that can only be broken with the Super or Ultra Hammer. Jumping in the center where the block once was will reveal the hidden ? Block. The Toad House in the village. Mario receiving the Power Jump badge from Goompa in the village. Goompapa getting mad near the east gate. Goompapa wishing Mario and Goombario well. Mario getting a Star Piece from Goombaria in the village. Mario getting a Star Piece from Goompa in the Goomba house. Goompa talking to Mario while fixing the veranda of the house. Mario getting a Star Piece in the clearing southwest of the village where he once fell. After defeating Jr. Troopa, Mario gets 20 Star Points. Mario doing a First Strike on the northwestern path. The Star Piece by the path. This page was last edited on September 17, 2018, at 18:23.